Please note I am cross posting this from here. Don’t forget to check out our upcoming webcasts and our past webcast replays. Welcome to the latest issue of the BI Bulletin, a monthly newsletter keeping you up-to-date on important business warehouse and business intelligence initiatives, events, and member offerings. This newsletter features sections that highlight various activities and action items for you to be aware of. We hope this information allows you to take full advantage of your ASUG membership. 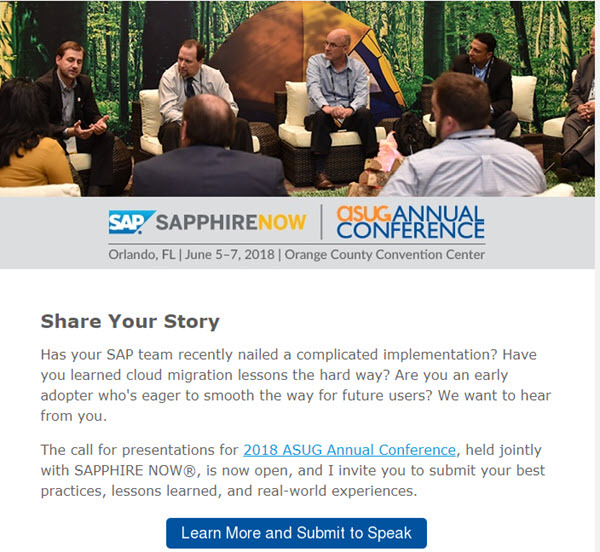 2018 ASUG Annual Conference, held jointly with SAPPHIRE NOW®, will be held at the Orange County Convention Center, in Orlando, Florida, June 5-7, 2018. The call for speakers is open and the deadline to submit is Friday, Dec. 1. If you have a success story, lessons learned from a recent project, or a lively debate that could expand into a panel or roundtable, please consider submitting an abstract. Speaking at ASUG Annual Conference is an excellent way to showcase yourself and your organization, and selected speakers may be eligible for complimentary registration to the conference. Before the conference, we’ll be sharing some presentation tips, so don’t let the lack of public speaking experience hold you back. Draft a presentation abstract today! The ASUG Business Intelligence Community needs your help. We are conducting a membership survey to help us assess the level of satisfaction with the services we provide and ways we can improve.We want to provide services that are important to you, refine those that need improvement, and introduce new services that address your goals.We realize you have many demands on your time. This short survey can be completed online in three to five minutes. Your input is important to us, and responses will help us better meet the needs of our members. Please complete the survey by Friday, Dec. 8. A few submissions will be selected randomly for prizes.Early survey results show that many of you want to learn more about BI admin best practices. As a result, we have a webcast scheduled in Jan. 23 on this.The survey also shows that many of you are planning an upgrade to BI4.2, so please join us for Best Practices for Upgrading to SAP BusinessObjects BI Version 4.2 on Jan. 30. BI + Analytics Conference – Why Go? 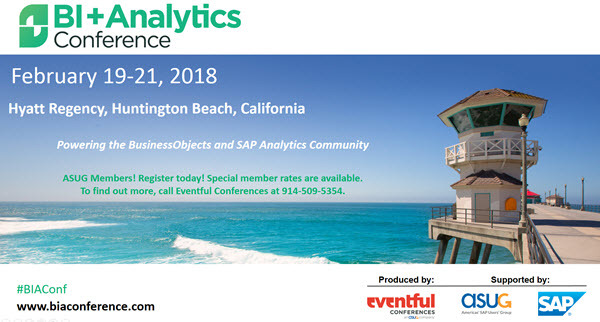 BI + Analytics Conference will take place in Huntington Beach in less than three months, Feb. 19–21. This year, Eventful Conferences is producing the event. This will be the eleventh annual BI event; began back in 2008 at the Hilton Anatole in Dallas. Be sure to check out the conference brochure.The conference producers give youfive great reasons to attend.This conference is known for its hands-on sessions, and this year is no exception. There are hands-on sessions for SAP Predictive Analytics, SAP Lumira Designer/Discovery, and more. Last year the sessions were completely full, with waiting lists.Check out the full lineup of conference speakers. Some are from SAP, but many are customers telling their own stories. You can also check out the agenda or download the whole schedule.See you in February. The tenth-annual face-to-face event will be held at Northern Kentucky University (Highland Heights, main campus), located in the greater Cincinnati, Ohio area. This year’s event will feature SAP HANA / BI / BW tracks. Many ASUG chapters have meetings planned for December. Check the ASUG calendar for meetigs in your location, and take advantage of the free education and networking opportunities. Next Over 4400 learners have registered for this openSAP course on the SAP Transformation Navigator – shouldn’t you?